“Becoming Whole: From Secular Learning to Religious Living” – a free all-day undergraduate student conference will be held on January 19th, in Provo, at BYU’s Gordon B. Hinckley Alumni and Visitors Center. Let’s take a lesson from some of our dedicated Utah faculty and learn about how education ought to enhance our religious experience, and how our religious experience should enhance and direct our academic and professional contributions. Our speakers will be Dr. Ralph Hancock (Brigham Young University), Dr. Harrison Kleiner (Utah State University), and Dr. Carl Scott (Utah Valley University). The theme of each of their lectures will be on how a secular book/author of their choice has increased their understanding of a foundational principle of their religious denomination, and how this experience inspires their actions and beliefs. Join us at Gordon B. Hinckley Alumni and Visitors Center on January 19th, and get to know some of our brilliant students and faculty across Utah and Idaho that are also striving to understand how to cultivate virtue, personal responsibility, and a greater sense of justice. This entry was posted in Uncategorized on January 12, 2019 by Huenemann. Need help writing a philosophy paper? We have this site on the blogroll on the right (“How to write philosophy”), but I thought I’d call attention to it explicitly since we find ourselves at the beginning of a new term. Useful pointers – even for those of us who *think* we already know how to do this! This entry was posted in Uncategorized on January 9, 2019 by Huenemann. 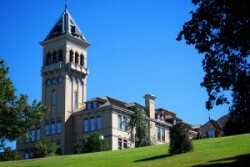 Two USU philosophy majors of years gone by will be visiting campus, and students are encouraged to meet with them, and join them for a lunch presentation, to hear about their post-USU careers. This is a good opportunity to begin thinking about how to navigate your life after graduation, and to consider the wide range of jobs you are well-suited for, even if you don’t yet realize it. I will post more details about their lunch presentations as they are made available. Also, if anyone is interested in helping with their visit (walking them around campus, introducing them at lunch), please contact me (Huenemann). Nate Putnam (Philosophy ’06, MBA ‘12) is tentatively scheduled to visit on Wednesday, January 30th. Currently the CEO of Monumetric, he is eager to share his experiences working in the area of tech advertising, which may appeal to a wide range of students. Ben Kolendar (Philosophy) will visit on Thursday, April 4. Ben has substantial government experience at both the local and national level and currently works as Deputy Director for the Department of Economic Development in the Salt Lake City Mayor’s office. He is eager to share his experiences since leaving USU with our students, and will be on campus from 11-1 that day for an alumni lunch presentation. This entry was posted in Uncategorized on January 3, 2019 by Huenemann.